A big smiling mouthful of wine, refreshing and attractively fruity with a snappy dry finish. Perfect to sip on its own or with lighter fish and chicken dishes. Very good value for money too. 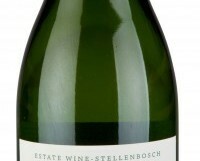 Chenin Blanc is the greatest chameleon grape of them all, happy to be made into sparkling sweet or dry white wine. In its home territory of the Loire Valley, you will find it in every style and in all its wonderful glory. But today we are in South Africa the only New World country to have significant quantities of Chenin Blanc. At one stage it made up a third of all vines planted. Familiarity seemed to have bred contempt, as for many years South African winemakers seemed completely uninterested in Chenin. This has changed over the last decade; you can now find some seriously good examples. You may come across the odd sweet wine but the vast majority are dry, ranging from light and crisp to rich and textured. Today’s wine could not be described as serious. It light and fruity, but I enjoyed the quality of the fruit; none of those confected fruit popsicle flavours you get from so many inexpensive white wines.